Failed singer/musician and doomed to a life of temping, Keith Carter is now a professional character comedian, actor and writer. 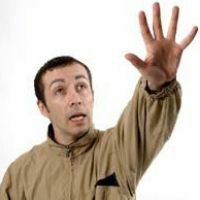 His seventh comedy gig was as a finalist for the BBC New Comedy Awards in 2001, since then he has traveled throughout the world, supporting many top comics such as Ricky Gervais and Johnny Vegas and has won several awards including Liverpool Echo Comedian of the Year in 2003 and North West Breakthrough Comedian of the Year in 2005. Capital of Culture judge, Sir Jeremy Isaacs was quoted in the news as saying, 'He helped Liverpool win the bid,' after seeing Carter's comic creation and Liverpool cult hero, 'Nige' perform at the cultural bid show for the judges. A versatile character actor, Carter has had absolutely no training in the acting profession apart from sheer experience and has appeared in several TV, radio and film productions, from lowly extra in 'Coronation Street' in 2000 to his first lead role in the BBC 2 drama, 'Domestic' in 2002. Carter is a regular performer at the Edinburgh Fringe Festival, receiving praise from critics and audiences alike for his one man shows and plays. After a critically successful one man show at this year's Edinburgh Festival, Carter has been asked to write a TV series around Nige for BBC 3, a guide to Liverpool's capital of Culture for BBC 4 and a Radio 4 series based on life at Ford's car plant as experienced by his father. The two highlights of his showbiz career are having his one and only single played by John Peel and accidentally knocking George Martin into an ice sculpture whilst drunk.